An all-in-one solution to sync your iPad/iPhone/iPod with computer which can be used as iPod to PC transfer, iPhone to PC transfer, iPad to PC transfer and even iPod to iPad transfer. You can manage & transfer app, videos, music, photos, podcasts, TV shows, eBook, audiobook and other contents between device and PC. 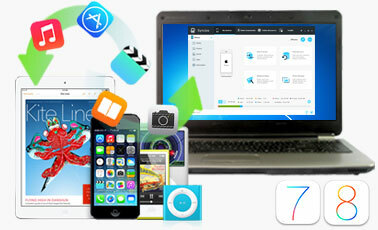 Convert video & audio to Apple devices compatible formats. With the iPod Transfer/iPhone Transfer/iPad Transfer software, you can backup, upload, copy, save, transfer, and move iPad/iPhone/iPod contents between iOS devices and PC. iPhone Transfer is an ideal iPhone transfer tool to backup iPhone music and video to PC, copy iPhone content to iTunes and easily transfer files from computer to iPhone. Sync iPod Classic, iPod Mini, iPod Nano, iPod Video, iPod Shuffle, iPod Touch, and iPhone with computer! iPhone/iTouch/iPod to Computer Transfer Softare is an easy to use iPod/iPhone utility designed to help you backup all your files from your iPod/iPhone/iTouch. Recover lost or missing music or backup and restore all of your iPod/iPhone/iTouch content; including your favorite songs, videos, photos, play lists and more. This iPod Transfer software can transfer music, playlists, video, photos and games from an iPod to your PC, synchronize your iPod with iTunes. The iPod to PC Transfer application is a useful utility which designed to help you get your iPod contents off from any iPod and back into any PC. It also gets the function to put those contents from your PC back onto any iPod. A better and easy way to sync your iPod and iPhone with computer is using dedicated transfer software, rather than using iTunes. iPod to PC Transfer and iPhone to PC Transfer software can transfer videos, music, photos, podcasts, TV shows and other content between your iPod/iPhone and PC. With the iPod Transfer/iPhone Transfer software, you can transfer videos and music from iPod/iPhone to computer and transfer files from PC to iPod/iPhone easily.